As some of you might have already heard, today is Nakbah Day. 64 years ago, on this exact day, was the day where Israel laknatullah was declared as a state. Since then, there have been massive migration of Jewish from across Europe and Rusia to Palestine, in which the number reached up to hundreds of thousands. Eventually, little by little, the Palestinians were chased of their land, through lies and force. Not only the lands taken from the rightful owner of the Palestinians, but also they were seriously breaking the international agreement. Until today, Israel continues to show no humanity on the Palestine. The Palestinians have been suffering for more than 64 years while we, citizens in other parts of the world continue to live our lavish lives without even bothering to know about what is happening to our brothers and sisters and is a shame on all of us. 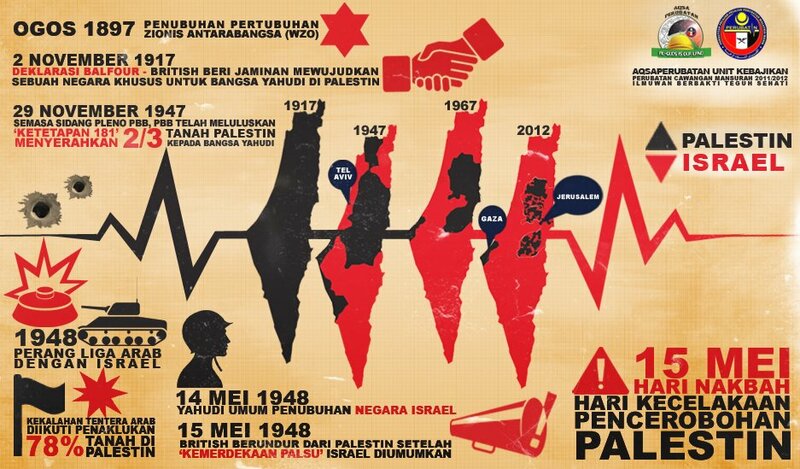 Today, PERUBATAN Cawangan Mansurah had released a poster in regards to Nakbah day. With its simple yet catchy design, the poster portrays an accurate and detailed chronology of events that leads to the Nakbah Day. You can also show your support and spread awareness by setting your profile picture to any of these men and women histograms(picture below). Unlike the usual default profile picture, these pictures are set in brown background, with the ‘men’ and ‘women’ clad in brown uniform (the women had put on hijab) with some words in Jew written on the clothing. It represents the Palestinian political prisoners who were, and are, detained by the Israel while the writings are “Shabas”, which is the abbreviation of the Israeli Prison Service. So let us show the world that the eyes of Muslim do not close from the suffering of our fellow Muslim brothers and sisters in Palestine! One Muslim suffering is the suffering of all of us! Support this..Berdoa yg terbaik utk mereka..
the picture is confusing. why do we need to show those picture of muslim's prisoners with that Shabas tag? just asking. i really dont get it.